If you’re a collector of records you’ll probably want to show them off in some way, shape or form. However, it is important to think about the way in which you store or display them in order to protect them from damage such as scratches or warping. So, if you want to invest in a new record case for display or storage of your favourite vinyl, you’ve come to the right place. We’ve rounded up a list of some stylish yet protective cases for your records that will keep their quality intact for years to come. Whether you own one or a dozen records, you need to think about how and where you want to store them and what your preferred style and budget is. If you’ve got one particular favourite, you may wish to make it pride of place in your home, in which case opting for a sturdy glass frame is a great way to make it a feature on the wall. If you’re super protective over the quality and condition of your records, look for a robust case with a lid, that will stop any dust or dirt from getting to them. And if you have a collection that you simply want to keep neatly out of the way, open boxes and shelving is a great way to save space and keep your records looking as good as new. 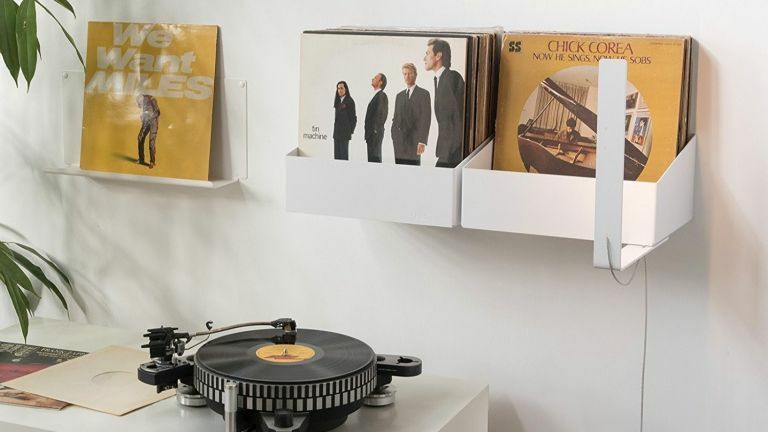 If you want to keep your records neatly stacked near to your turntable but are lacking space, then this handy little shelf is the ideal way to store and display your vinyl. It can hold up to 60 records and can be mounted to the wall anywhere you wish. This is a smart looking sturdy vinyl record case that can hold up to 100 albums and is great for keeping them tidied away so they won’t get damaged. Although this case comes with a carry handle, users have noted it doesn’t hold up well in transit, but it is perfect for easy access to your records in the home. If you just want an easy way to store your records that won’t break the bank, then opt for this cardboard box. It can fit up to 50 12 inch records in and you can label or decorate the box as you wish. It can then be easily stored near to your turntable or away under the bed or in storage for safekeeping. This black vinyl record storage box is ideal for displaying your records next to your turntable or keeping them stored away under your bed or in a cupboard. The laminated MDF gives this storage box a more expensive feel and it would suit most interiors. The large box can hold as many as 200 records and it is quick and easy to assemble. If you want to be able to easily transport your records, then this retro looking vinyl record case is the perfect storage solution for you. Although pricey, this carry case is made from high-quality material and is a great way to organise all your favourite music albums. This is perfect for any comprehensive 12 inch vinyl collection.